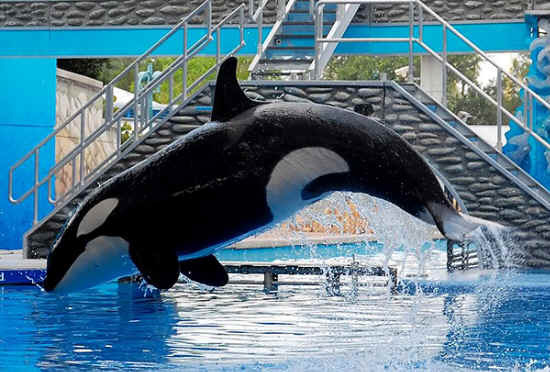 SeaWorld is fighting the public release of several court exhibits, including the training DVD, pool designs and pictures. The marine circus’s attorneys are claiming that making the information of the suit public will fuel animal rights organizations who could use the information to hurt the park’s public image and their ability to make money. And that’s the bottom line for SeaWorld: making money by risking the lives of captive animals and their trainers. But there’s a growing perception among the general public that something is seriously wrong with the whole concept of holding orcas in captivity. As SeaWorld gears up to testify at hearings that will help determine the marine circus’s culpability in the death of trainer Dawn Brancheau last year, several former trainers have been speaking out about the danger to which these people are exposed and about how wrong it is to be keeping killer whales predators in captivity in the first place. On NBC’s Today show, former trainer Samantha Berg describes how SeaWorld “sugarcoats” what actually happened when, for the third time since he’d been in captivity, Tilikum the whale killed someone. And the Orlando Sentinel reports on how ex-trainers charge the company with trying to minimize and cover up the extent of danger facing people who work in the water with the world’s largest marine predator. In the ocean, humans have rarely ever been hurt by these enormous animals. Any occurrences were clearly understood to be situations of mistaken identity, in which the orcas quickly backed off. (They’re not interested in humans as food, and have no interest in attacking anyone for fun.) But in captivity, there have been numerous cases of orcas clearly going crazy from being kept in tiny tanks, forced to do silly tricks, and eventually striking back at their captors. Earlier this year, Jett and another former trainer, Jeff Ventre, released a report detailing what life is like for orcas in captivity. The upcoming hearings, at which SeaWorld will defend its safety practices against charges by the federal government’s Occupational Safety & Health Administration (OSHA), were first scheduled to be held last April but have been delayed multiple times. The tentative date now is September 19th. Government sources have indicated that they’re having trouble securing a venue, and there may be a further delay, due to the fact that court houses in Florida are leery of hosting the hearings for fear of demonstrations by animal protection groups. Meanwhile, the family of Dawn Brancheau, the trainer who was killed last year by Tilikum, is trying to stop the video of her violent death from being shown publicly at the hearing. But at least one news organization is reporting that OSHA has refused to guarantee the confidentiality of the video. And that’s the bottom line for SeaWorld: making money by risking the lives of captive animals and their trainers. But there’s a growing perception among the general public that something is seriously wrong with the whole concept of holding orcas in captivity. And sooner or later, these marine circuses will no longer be able to keep pretending that there’s anything wholesome, educational or entertaining about what they do. If SeaWorld does not prevail at the upcoming hearings, it may no longer be able to have its trainers riding around entertainment pools on the rostrums (noses) of killer whales. If that happens, the whole show will have lost a major part of its attraction. So even though SeaWorld would certainly launch an appeal if the hearing goes against them, there’s a lot riding on the outcome.